Ah, it is that time of year again…there is a still a slight winter chill in the air, and in our hearts there beats a warmth for that special someone in our lives. Valentine’s Day approaches and as usual, restaurants are booked, florists are out sold out, and everyone is at their wit’s end trying to figure how to show their love. For me, I like to think it is the sum of small thoughtful gestures throughout the year, rather than a scheduled forced display, that speaks of true affection. And in the spirit of no-nonsense and being genuine, here is a simply pure and sweet dessert that will win anyone over: a fluffy and decadent chocolate mousse. Using only a few ingredients and a little skill, this is a wonderful way to end an intimate meal for two. 1. In a small saucepan over low heat, heat 1/4 cup of heavy cream with the chocolate, stirring constantly until the chocolate is melted. Remove from heat, stir in the other 1/4 cup of heavy cream. Transfer to a large bowl, set aside. 2. In a large bowl, beat the egg whites and sugar until a firm peak forms, but not too stiff or shiny. 3. Fold the egg whites a third at a time, into the chocolate mixture until just combined and smooth. 4. 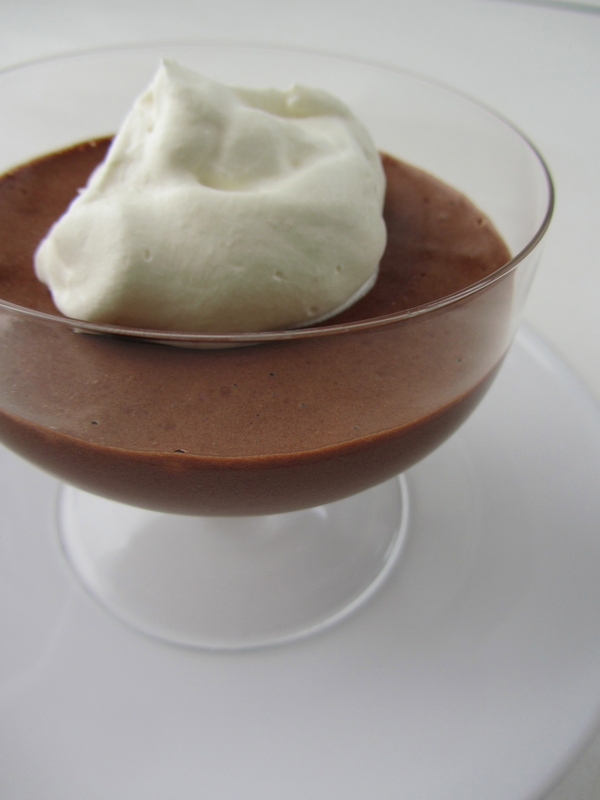 Divide mousse mixture into two serving dishes, refrigerate at least 3 hours. Serve topped with fresh whipped cream.